Due to my job scope, every month end i have a task of auditing and ageing the inventory in two warehouses. And this is what i dread most in my job. Every month end, i wish i could turn into an octopus with multiple hands to hold all my stuff for doing this task. Well, for years, i have been making do with a silly sling pouch that doesn't even match my outfit nor serving my purpose of carrying all my stuffs. Every time, i would find myself fishing into the pouch trying to locate what i needed thus scratching my mobile phone which i always carry with me just incase anyone who would want to reach me, (but was unable to do so as the warehouses is not equip with phones at all corners). 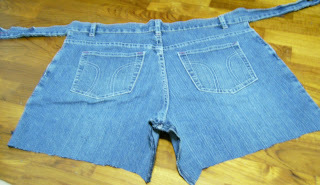 Luck just struck me when i was browsing the internet and came across this post on converting an old pair of jeans to an apron by craftsters - betz white. Oh yeah, i found this very innovative. This would just solve my years of struggling with a silly pouch. 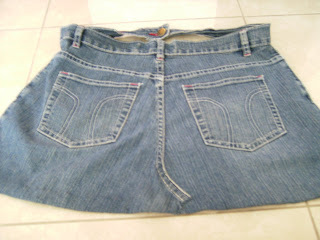 With the idea in mind, i set myself scouting into my pile of old clothes and i found this pair of old jeans - just what i needed. However, because i don't have a sewing machine at home, whatever sewing that is needed to be done will have to be hand sewn. 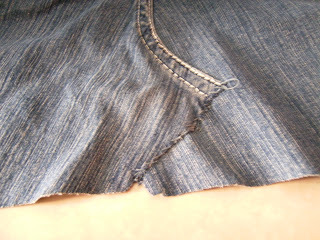 Therefore, i try to minimized as much sewing as possible. 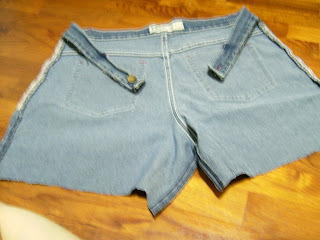 First, i trimmed off the legs so that the jeans turn into a short. 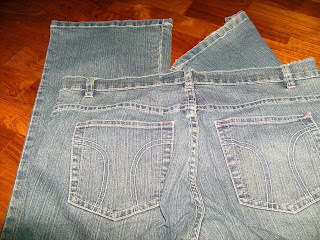 As i'm trying to have more pockets, i used the back pocket of the jeans so that i don't have to sewn the pockets again. 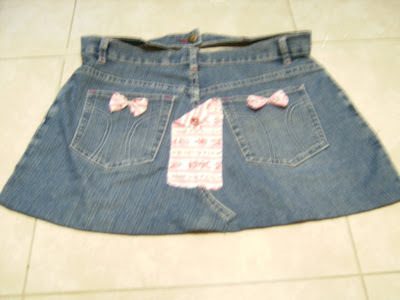 I also wanted to retain the waistband so that i don't have to sewn any tieback for the apron. I also retained the metal button and button hole of the waistband so that i can turn it around to hook behind my back and no extention is needed for tying. 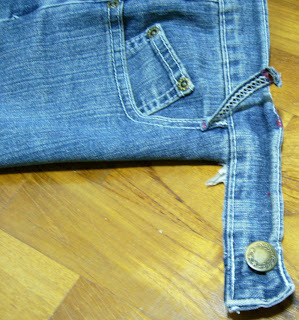 I also have to unpick the top of the front loop so that i can cut away the zipper front portion of the jeans. 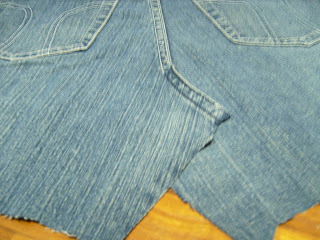 As i'm trying to minimize the sewing needed, i retained the side seam of the jeans which is aready machine seal/hemmed. This part, you have to be very careful when cutting - you have to cut as close to the edge of the seam as possible while retaining the machines hemmed portion so that there will be less frills from the cutting as time goes by. 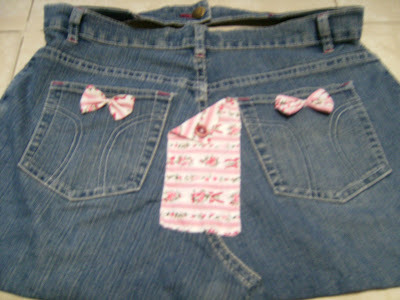 The reverse side of the apron. 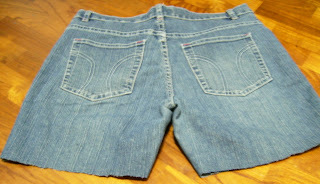 Note the uncutted side seam. 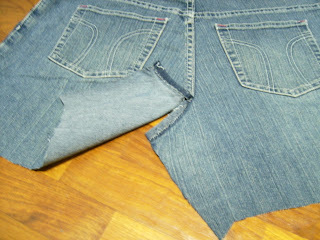 This is how the front of the apron looks after cutting off the front portion of the jeans. Notice the protruding crotch area? Therefore, i have unpicked this portion. 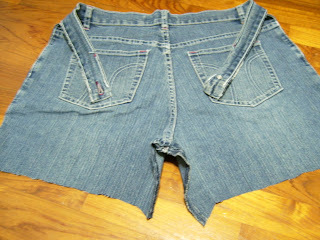 Next, i folded the bottom portion and securef it with pins before hemming the bottom with blind stitch. This is to prevent frillings from all these cuttings. My completed apron which i think looks plain. As such, figuring that i would need additional pocket specially for my mobile phone alone (so that i could keep all the rest of the things away from it to prevent scratching it), i decided to use left over fabric to add the additional mobile phone pocket and some emblishment to the apron to make it more interesting. 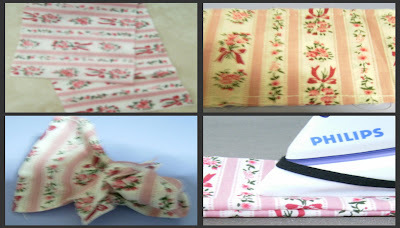 I cutted out a double folded piece of fabric enough for the size of my mobile phone. With right side facing right side, i hand sewn with back stitch round the corners, leaving a small gap so i can turn it inside out. 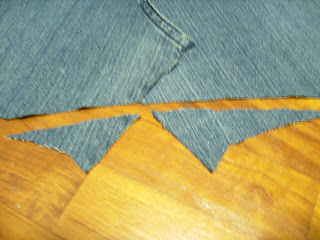 Next, using the iron to flatten the edges, I set it onto the centre of the apron and hand sew it with applique stitch. 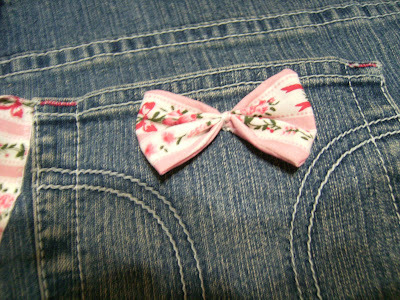 Using the same method, i hand sewn 2 little bow and attached it to the original jeans pocket to act as emblishment. This is how my bow looks. My completed apron which is no longer boring. 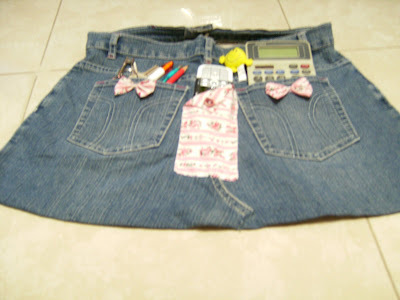 A closer look at my stock auditing apron. Viola! An apron that holds all my stuff.